Welcome to the Kenai Fjords National Park Information Page. The closest major airport is Anchorage, AK with a smaller airport at Homer, AK. Kenai Fjords National Park lies southwest of Seward, Alaska and about 130 miles south of Anchorage, on the Seward Highway. The park’s headquarters and visitor center is located in Seward’s small boat harbor. In addition to accessibility by road via the Seward Highway, bus and commuter flight service link Seward and Anchorage. The Alaska Marine Highway (ferry) System connects Seward with Homer and Seldovia via Kodiak, providing service to Valdez and Cordova. The Alaska Railroad serves Seward from Anchorage during the summer months. In summer, Exit Glacier can be reached by car on a gravel road (approximately nine miles), and a short trail. The Harding Icefield can be reached by air or trail. Air and boat charters provide access to the fjords. Although cultural resources are not specifically cited in the implementing language, they are part of the National Park Service management. In addition, in order to properly manage and interpret the natural environment, animal populations and plant communities of this unit it is necessary to develop a diachronic perspective. Humans have been part of this ecosystem and interacting with it for at least 8000 years. A basic inventory and evaluation of the archeological resources of Kenai Fjords National Park will provide essential information about human presence and activities of the centuries. 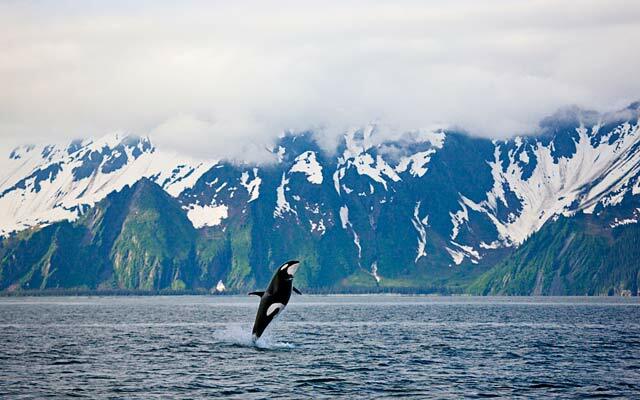 Kenai Fjords National Park is open year-round with the highest visitation May through September. The park’s wildlife is as varied as its landscape. Mountain goats, moose, bears, wolverines, marmots and other mammals have re-established themselves on a thin life zone between marine waters and icefield’s frozen edges. Bald eagles nest in the tops of spruce and hemlock trees. A summer burgeoning of life occurs in the fjords. Steller sea lions haul out on rocky islands at the entrances to Aialik and Nuka Bays. Harbor seals ride the icebergs. Dall porpoises, sea otters, and gray, humpback, killer, and minke whales ply the fjord waters. Halibut, lingcod, and black bass lurk deep in these waters, through which salmon return for inland spawning runs. Thousands of seabirds, including horned and tufted puffins, black-legged kittiwakes, common murres and the ubiquitous gulls, seasonally inhabit steep cliffs and rocky shores. Kenai Fjords National Park occupies the southeastern portion of the Kenai Peninsula in the south-central part of Alaska. The Peninsula is located within the Kenai-Chugach mountains physiographic province, a division of the Pacific Mountain System. The park lies completely within the Kenai Mountains topographic unit. This unit covers an area of 1860 square kilometers (760 square miles) and elevations lie generally between 1220 and 1600 meters ASL. The predominant bedrock is graywacke and shale. Other common rock types are greenstone, tuff, and chert. The region was uplifted and eroded at various times during the Tertiary and Quaternary periods. Currently, fluvial and glacial deposits overlie bedrock in all areas except the high, steep slopes. Soils of the region are characteristically shallow, poorly developed, very gravelly, and acidic. Captain Vitus Bering, in 1741, was the first known European to see the Kenai Peninsula. Captain James Cook made the European discovery of Cook inlet in 1778. After Cook’s visit the area became the scene of bitter competition among rival fur companies for the natural resources of Russian America. Alexander Baranof named Resurrection Bay in 1792, finding it a welcome refuge from Pacific storms. In 1793 Baranof selected a site on the west side of Resurrection Bay for a ship building port. At least three major vessels were built at this port, named Voskresenski Harbor, before its abandonment around 1796. The location of this site was lost and it has not yet been rediscovered. The area was controlled by the Russians until the United States purchase. By that time, trading posts had been established at Nanwalek, Kenai, Tyonek and Iliamna. The first American settlement in the Seward area was in 1884, by William Lowell. The railroad connecting Seward to the Interior was conceived in 1898 and completed by 1915. At contact, the aboriginal inhabitants of the area that is now Kenai Fjords National Park were most probably Pacific Eskimos with Tanaina (Dena’ina) Athapaskan groups as near neighbors. Of the Eskimos, the Chugachigmiut (now Chugach) lived in and adjacent to Prince William sound; the Unagalakmiut occupied Kayak Island and the adjacent mainland; the Unixkugmiut resided on the south coast of the Kenai Peninsula. Little recorded history exists relating to the Ugalakmiut and the Unixkugmiut, but their culture was apparently quite similar to that of the more populous Chugach. The Chugach people represent the extreme extension of Alaskan Eskimo culture in a southeasterly direction. Archeological studies indicate that the Chugach existed with little cultural change in this region for at least 500 years prior to the European discovery of Alaska. Kenai Fjords National Park encompasses nearly 65% of the Harding Icefield, plus the fjords, islands and peninsulas of the Kenai coast. The icefield is a remnant of the Ice Age – a surviving expanse of Pleistocene glaciation. Numerous valley glaciers flow outward from the icefield, some reaching the sea, others ending in lakes or on bare ground. Along the coast glaciers have cut deep bays into the mountainous shoreline, creating a series of deep fjords. Heavy vegetation of almost rain forest proportions covers the tops of cliffs rising a hundred feet or more above the ocean. The coastal area has abundant aquatic life, including seals sea lions, sea otters and migrating whales. Sea birds in large numbers occupy the coastal cliffs in summer. Seasonally, littoral resources such a shellfish are easily accessible. Salmon runs are also abundant. Food and supplies can be obtained at local restaurants and grocery stores. When going backcountry bring your food, equipment and other supplies with you. Avoid food such as bacon or smoked fish, soaps, and cosmetics with strong odors as they attract bears. Bottles and cans are hard to dispose of. If you take them in, you are expected to carry them out. Without some sort of bear proof storage, you should be prepared to hang your food as high as possible. Federal Aviation Administration regulations prohibit carrying fuel in containers such as stoves on commercial airlines. Use white gas. Kenai Fjords is truly a wilderness park with very few trails and lots of room to explore. A network of short trails begins at the ranger station at Exit Glacier. Know your boat and its operation. All federal and state boating regulations apply. Carry signal equipment and a survival kit that includes temporary shelter, warm clothing, and extra food. A seaworthy craft and rough-water boating experience are absolutely required. Icy-waters can lead to hypothermia and death in minutes. File a float plan with a responsible person. There is a campground, Exit Glacier that has 10 walk in summer camping sites and four backcountry cabins. Visitors must obtain reservations and permits in advance. Overcast and cool days are frequent in this maritime climate of abundant rain. May is the driest month; successive months see increasing precipitation. Summer daytime temperatures range from the mid 40’s to low 70’s (F). The wet, stormy fall begins in September. Wool or synthetic clothing and sturdy rain gear – pants, coat and hat – are essential.